Is It a Migraine, Low Blood Sugar, a Seizure…or a Stroke? They’re called stroke mimics. The symptoms are similar to a stroke—slurred speech, a weakness on one side of your body and confusion—but what you’re experiencing is actually low blood sugar, a migraine or another condition. If you know you have diabetes, suffer from migraines, have a seizure disorder or other conditions, you may be tempted to ignore possible stroke symptoms. That’s a big mistake. Reason: When you’re having a stroke, minutes—even seconds—count. Getting emergency treatment with blood clot–dissolving medications—typically tissue plasminogen activator (tPA)—or other therapies can mean the difference between life and death and can dramatically affect recovery. To learn more about stroke mimics, we spoke with Edward Jauch, MD, director of the division of emergency medicine at the Medical University of South Carolina. When blood sugar dips too low, a common problem for people who take medication for diabetes, the symptoms mimic a stroke—confusion, feeling dizzy or light-headed, slurred speech and/or muscle weakness. Clues that it may be hypoglycemia, not stroke: Symptoms may build up slowly, rather than occur suddenly, as they do with a stroke. If you do a finger prick and discover your blood sugar is low, and if symptoms resolve after eating a glucose tablet or drinking a half cup of fruit juice, it’s likely not a stroke. But if you have any doubts, call 911. Be sure to tell the EMS professionals that the patient is a diabetic so they can rule out hypoglycemia with a finger-prick test—and maybe save a trip to the ER. It’s actually standard practice to test everyone’s glucose right away, whether or not they have diabetes, but it’s not always followed, says Dr. Jauch. You may remember when the newscaster Serene Branson frighteningly lost her speech during a live broadcast, and everyone thought she had had a stroke. Well, it turned out to be a hemiplegic migraine. This type of migraine can cause loss of speech, weakness and other strokelike symptoms. You know you get migraines, the pain is familiar, and an aura precedes the symptoms. The headache comes on gradually, over several minutes or longer, intensifies to a peak and tends to be throbbing or a dull ache. You have known triggers such as stress, caffeine, foods, weather changes, etc. You have visual disturbances such as seeing flashing lights or wavy lines. You’re older than 50, and you’ve never had a migraine. 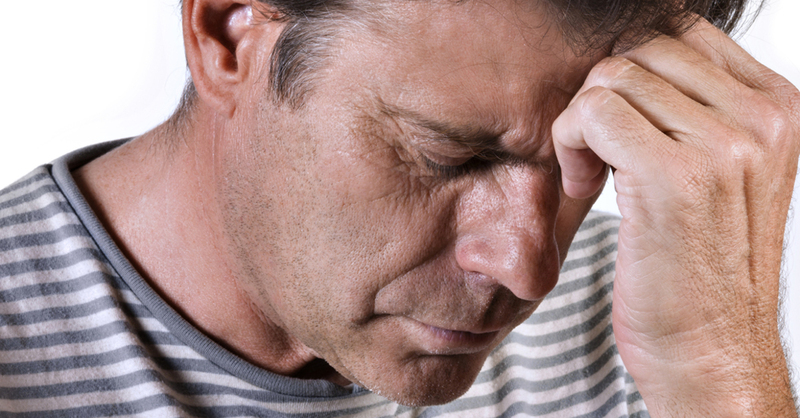 Migraines don’t tend to develop after age 50. The headache comes on suddenly and is the worst headache of your life. You have visual disturbances that involve loss of part of your visual field—you may bump into things because you don’t see them, for example. As always, when in doubt, call 911. It’s particularly important for people who get migraines frequently to pay attention to possible stroke symptoms. “There’s a small increased risk for stroke in people who have migraines, but we are still researching if treatment of a migraine reduces stroke risk,” says Dr. Jauch. The patient has a history of seizures, a bite mark on the side of the tongue—or confusion that gradually improves. Typically symptoms subside with time…from a few minutes to a few hours. Clues that it may be a stroke: If there is confusion, it is persistent and doesn’t improve. If you’re concerned that it’s a stroke, time isn’t on your side. EMS guidelines state that the ER team should consider stroke if someone has a seizure and has symptoms of neurological deficits, such as weakness, numbness or language issues, particularly if the patient doesn’t have a history of seizures. Sometimes, seizures are symptoms of a stroke. Bell’s palsy causes facial drooping, but it’s not because of a stroke. It’s typically caused by a viral infection such as shingles or the flu or Lyme disease that leads to an inflammation or infection in the facial nerve (called the seventh cranial nerve). It can also cause your eyelid to droop, drooling, dryness of the eye or mouth or excessive tearing in one eye. Though this is easy for the pros to diagnose, patients often confuse it with a stroke. It typically causes significant facial distortion including the forehead. Facial symptoms are your only symptoms. You’re older than 60, when Bell’s palsy becomes less common. You have other stroke symptoms, not just facial droop. Not sure? You know what to do—call 911. Brain tumors can also cause symptoms that mimic stroke, such as headache, confusion, nausea, weakness and disturbance in the way you walk. Clues that it’s a brain tumor rather than a stroke: Symptoms are headaches that are worse in the morning, when coughing, exercising or changing position. Both are serious ailments, of course, so these symptoms, whatever the cause, require immediate attention. For any of these unexplained symptoms, you would likely be given a CT scan, which would pick up the tumor versus signs of a stroke. WHAT HAPPENS IF I THINK IT’S A STROKE AND IT’S NOT? Stroke mimics confuse even health-care professionals. In one study, about 20% of the time when neurologists thought patients were having a stroke, the cause was a different condition. The result can be getting a CT scan and treatment when it’s not needed, with all the anxiety that entails. But the risk for harm is much lower than having a stroke and not getting it promptly treated. Here’s what you can do: Help health-care professionals by giving them the right information. Let them know if the symptoms came on suddenly (common in strokes) or more gradually (uncommon), and let them know when the symptoms began or when the person was last known to be normal. If the patient has diabetes or is subject to frequent migraines or has a seizure disorder, tell the EMS professionals right away. Also let them know if the person takes any form of regular medications. It’ll help them sort things out quicker. Face drooping. One side of the face may droop or become numb. Ask the person to smile, and check to see if the smile is uneven. Arm weakness. One arm only may be weak or numb. Ask the person to raise both arms, and check to see if one arm drifts downward.